Here is a list of some very special athletes who have positively impacted Kyle's life. They recognize how they can affect a life just through a message, a visit or a gift and they take the time to do it. I am so impressed with all of these people. Ryan Matheus- Ryan did a very special thing for Kyle and a few of his buddies this summer. 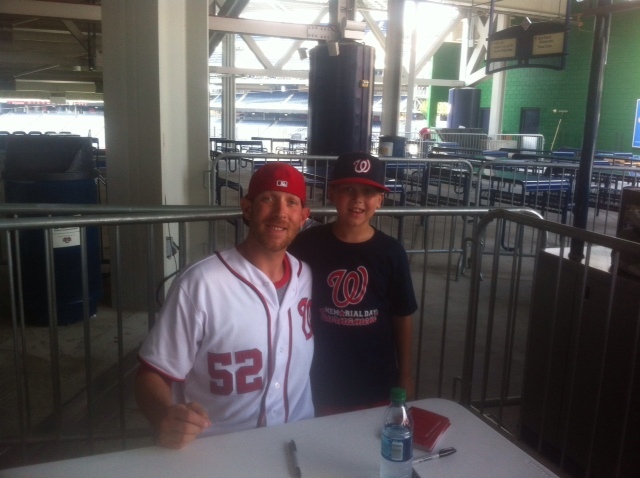 After a camp at Nats Park Ryan invited them for a very special visit to the Nationals Locker room. He gave them each a game ball and brought them into Davey Johnson's office to meet the skipper. Jayson Werth- Jayson invited Kyle to a Nats game and spent 30 minutes with Kyle and our family before a game giving us a tour of the Nats facilities. Bryce Harper- Bryce has talked to Kyle on a couple of occassions at Nats Park. He also started up Harper's Heroes which has been huge for local families fighting pediatric cancer. Javy Lopez- Pitcher, SF Giants, UVA, Robinson HS- One of my former players, Logan Hyer and his family got in touch with Javy and brought Kyle a wonderful assortment of autographed items. Javy played locally, including a stint with the Barnstormers before going on to win the World Series with the Giants this past fall. Jim Riggleman (Nats Manager)- He flew in from Florida to visit Kyle and then all of the other Oncology patients on this floor on Tuesday. He spent well over an hour here and was just such a genuine caring person. Alex Ovechkin (Caps)- A big assist from Chris Albrittain on this one. The Great 8 took the time on a game day to find a special hockey stick for Kyle and personalized it directly to him. Ryan Zimmerman (Nats)- As most people know we are huge UVA fans. Kieran and Kyle's Uncle Jerry both went there and I know the current coaching staff there as well. Ryan sent Kyle a special message today on his Caring Page. How special is that? Anthony Armstrong (Redskins)- Anthony also sent Kyle a special message on his Caring Page and Kyle loved it. Kyle was so excited to see Anthony play well again this week vs. the Colts. A big assist from John Keim on all of the Redskins messages. Reed Doughty (Redskins)- Reed sent Kyle a very touching message that is tough to get through without getting a little emotional. It shows what a caring individual he is. Reed also had a big game against the Colts with a number of tackles. He seemed to be all over Dallas Clark. Casey Raubach (Redskins)- Casey was another member of the Skins who sent Kyle a message. Most people probably don't realize just how special this can be for a young child. Another truly great person who took the time out of a busy season to send Kyle a message. Lorenzo Alexander (Redskins)- Please see Lorenzo's message to Kyle on 11/4. It takes a special athlete to take the time to do that. We are hoping that Lorenzo makes the Pro Bowl as a Special teams player. He is playing well at LB also. Andre Carter (Redskins)- Add Andre to the list of athletes with a tremendous amount of class. Andre sent Kyle a message on Monday, Nov. 15. You just don't understand how much an athletes call, message, visit or gift means to Kyle and kids that are sick like him. Joe Gibbs (Nascar and Redskins)- Joe Gibbs sent Kyle a personalized autograph photo today. He also included a couple of hats and other goodies. There is not a bigger legend in the DC area and Coach Gibbs and his foundation have truly made a difference in many kids lives. Brad Smith and New York Jets- Brad made a personalized video message for Kyle on December 6th. Kyle has already watched it about 10 times. The NY Jets are also sending Kyle a care package. I think the Jets are now his second favorite football team. Kyle Bush (Nascar)- Kyle sent our Kyle an autographed photo. He is a member of Coach Gibbs' racing team. Kyle H. now will root for the M & M's car along with the other members of Coach Gibb's team. Denny Hamlin (Nascar)- Denny also sent Kyle an autographed photo. Kyle is now excited to watch some Nascar and root for #11 as part of Coach Gibbs' team. Joey Lagano (Nascar)- Another member of Coach Gibbs' team. #20 can be added to the list of Kyle's three favorite Nascar drivers. Charleston Southern Baseball Team- A big thank you to Denis Buckley and the CSU Bucs. They have been saying prayers for Kyle after practices and sent Kyle an awesome goodie bag, including a CSU Baseball t-shirt with autographs from the entire team. Washington Redskins Cheerleaders- Kyle received two personalized autographed photos from the Redskins cheerleaders in late November. Let' s just say that he appreciated this much more than he did the one from the Cowboys cheerleaders. Dallas Cowboys Cheerleaders- Kyle received an autographed photo (personalized) from them on 11/5. Maddie is really bugging Kyle to give it to her even though it is personalized to him. I would also like to add that Kevin Johnston who is a former Stars player and current Chantilly HS player has been great with Kyle. His messages and his gifts to Kyle have been tremendous.